A Green Smoothie is the answer! It is scramble-time here at our house. Also, it’s Crazy Town. It’s nuts. Our annual melodrama will open in a little more than a week, so the legal pad on the kitchen counter top is filled with puzzling notes and to-do lists: “Paint hotel flats. Write program. Call Jackie. Find ropes. Pick up key. Make granola. Call Dad. Timothy–haul wood and start fire on the sunporch so we can paint out there!” After the show, we always are thankful we did it and count it among the most satisfying experiences. But a week before–we’re scrambling and fretting and wondering if we’ll pull it all together one more time. 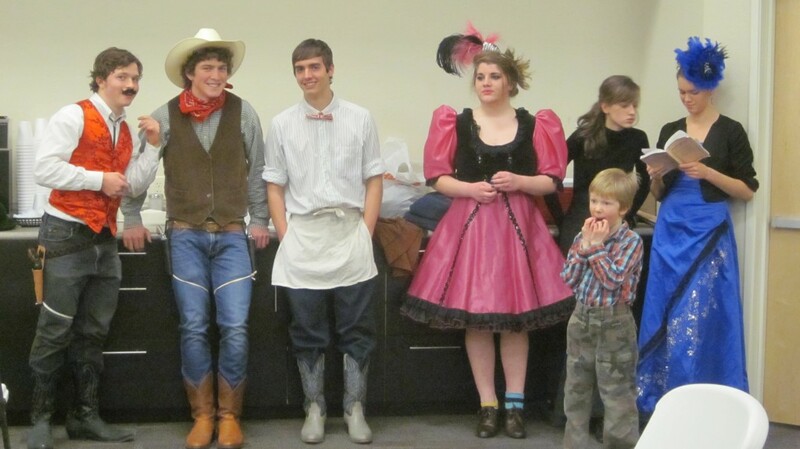 Here’s a line-up of actors waiting to go onstage during rehearsal, and little Mack. It’s definitely crunch time. One thing that I do appreciate about these last two weeks before the melodrama is that I intuitively eat less and usually lose a few pounds, specifically, the few pounds I probably gained over Christmas vacation. I am a deer, running through the woods, wild-eyed and panting, pushing–pushing–giving it my all to stay out of the mountain lion’s grasp, the lion that is only three steps behind me, and so I cannot afford to stop and eat something heavy that will slow me down. Well, maybe that’s a tad overblown. But not by much. In any case, desperate times call for desperate measures, and for me, that means a green smoothie for lunch. Question: How can I incorporate more greens, with their rich supply of vitamins and nutrients and yes, even phytonutrients, into my diet? I can only eat so much salad, and the experts say that leafy greens, calorie for calorie, are the most nutrient-rich food I can eat. Answer: By eating a green smoothie. Question: I know I should try those chia seeds–packed with healthy Omega-3s and antioxidants, and the superfood of those amazing ultra-distance runners of Mexico, the Tarahumara Indians–but I don’t know how to get them into my diet! What do I do with them? Answer: Blend them into a green smoothie. Question: My jeans have gotten tight over the winter, so how can I lose a few pounds quickly, without getting cranky or feeling deprived or driving my family insane? Answer: Eat a green smoothie for lunch every day. Question: I just don’t have time to make myself a nutritious lunch, but don’t want to grab fast food or skip lunch, either. What can I do? Answer: Eat a green smoothie! Question: How can I justify eating a big dollop of whipped cream for lunch every day? Answer: Eat a green smoothie! I started eating green smoothies a few years ago, when I read a book about the health benefits that could be wrought from adding so much green to your diet every day. 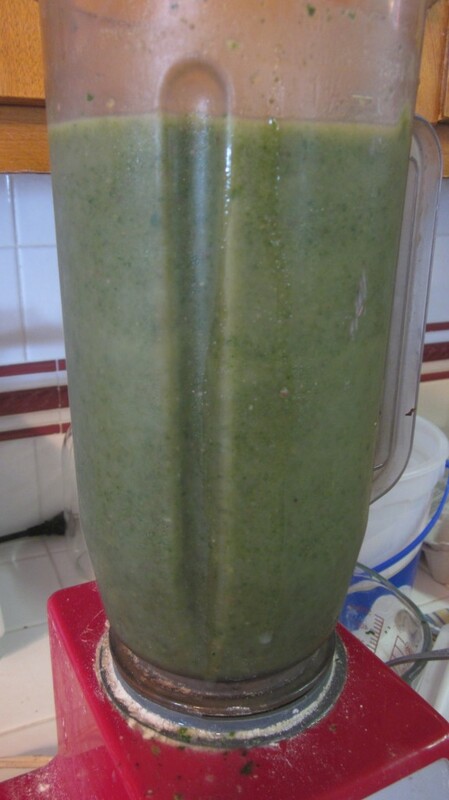 During the summer, I have no problem coming up with greens for my smoothies: nettles grow wild around our place and are very nutritious; there’s always kale and lettuces and herbs in the garden, and I grow anise hyssop which is very good in smoothies, too. During the winter months I buy frozen spinach, or the greens at the grocery store will do, too: romaine lettuce, spinach, or kale all work well in a green smoothie. 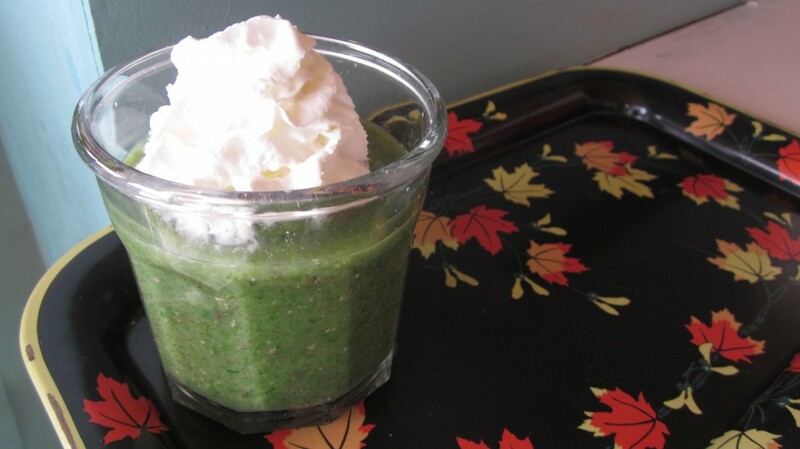 I’m going to share my basic smoothie recipe with you, and you can tweak it however you like. You can add different fruits, or different greens, or really anything that suits you. Well, I’ve never figured out how to get garlic in a smoothie (oh, missed opportunity–it’s so nutritious, too!) but you get the idea. Yum. . . and this is after the blending. 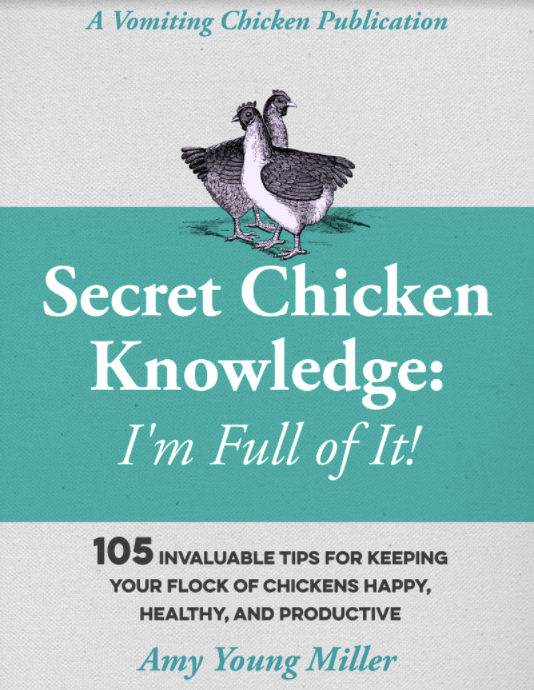 Well, without further ado, I’ll get this recipe going for you! It's good for whatever ails you. Change it up however you like, just be sure to add enough liquid that the blender will run effectively! 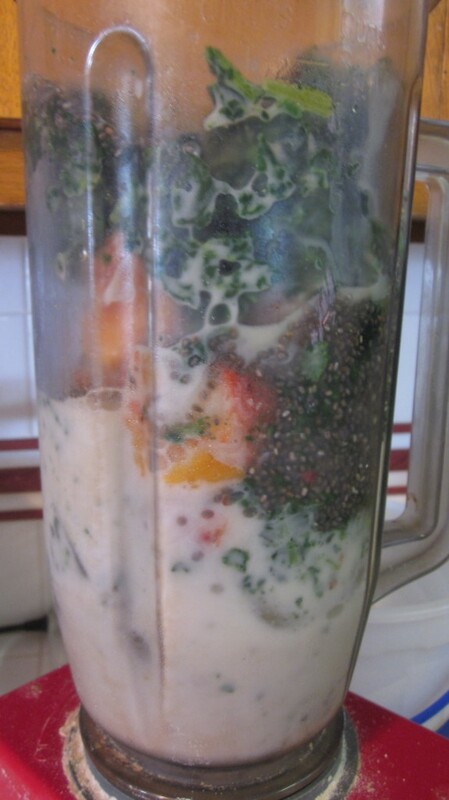 Dump all ingredients in the blender, and blend until smooth, adding additional liquid if needed. Taste and adjust sweetness with additional honey, if preferred. Add a dollop of whipped cream and enjoy! 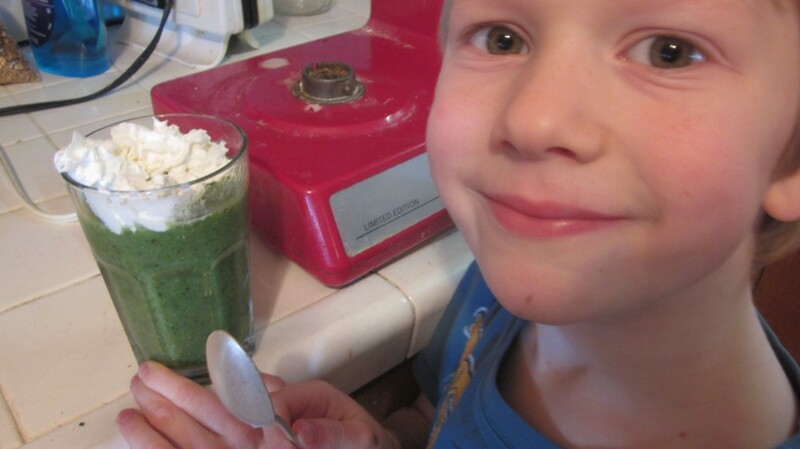 See how easy it is to make yourself and your family green smoothies? And before you know it, you’ll be squirreling away leftover dabs of fruit in your freezer, like me, not to mention overripe bananas, for the sole purpose of augmenting your lunchtime green smoothies! Pretty easy way to get a big smile around here–make a green smoothie! Oh, wait–that could be another question. Okay, final question: How do I get some great big happy smiles out of my kiddos? Answer: Make a green smoothie! Just reading this recipe already makes me feel healthier! Just think of how much healthier you’ll feel (and be!) if you actually make (and eat!) a few green smoothies. Try it! Thanks Sheri–if you try it, I hope you enjoy it! It’s wonderful how much nutrients you can get into a green smoothie, isn’t it? 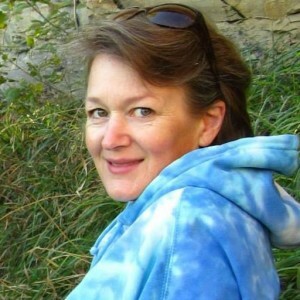 Thanks Anita-Clare–that means a lot to me, coming from you! I hope you get that smoothie maker out again one of these days! with you on this one 100%. Breakfast for me this morning was a dark green smoothie. It has Kale, spinach,parsley, broccoli, red and green oak leaves, romaine, mustard greens, frisee, arugula,radicchio, uncooked rolled oats, chia seeds, flex seeds, papaya and blackberries (everything organic) I forgot to add the apple, and my wife got the last banana. Saved the coconut juice for lunch later. I am back into the shakes after taking some time off, which resulted in my pants shrinking a tad. Wow, Chef, that’s an impressive array of greens you have going there! The papaya and blackberries wouldn’t make it into a smoothie at our house, I’m afraid, we’re all crazy about them. I really do feel better when I’m eating green smoothies every day. I just don’t eat that many greens, otherwise–except during garden season. Thanks for your comments! I really enjoy juicing. I have worn out more than one juicer! Will have to give this recipe a try. Thanks, Toni! I hope you like it! More power to you….I’ll stick with red, blue, or chocolate..
haha Roy, okay, your objection is noted! And I must admit I’m very impressed by your use of the word ‘eponymous.’ Well done! Bravo Girl 🙂 love it – I would avoid the cream but the rest superb! I’m glad you approve! I agree that the whipped cream could be skipped entirely, but my kiddos like it that way! In fact, I think that’s how I got them to try green smoothies in the first place! Thanks for your comment! I was just thinking about carrots the other day. I love raw carrots, but unfortunately after 47 years of rampant chocoholism (made up word) my teeth aren’t up to the challenge. I was wondering about smoothies, and your post has nudged me over the edge – I’m going to give them a whirl! One question though, and I hope it’s not a silly one – why does the fruit need to be frozen? Just so the result is cold? The only reason I like the fruit frozen is that the smoothie is more icy, and resembles ice cream or sherbet that way! You don’t have to use frozen fruit, and you don’t even have to add the ice cubes. You could probably even throw a carrot in and see what happens! It’s a very forgiving recipe! I hope you try it!